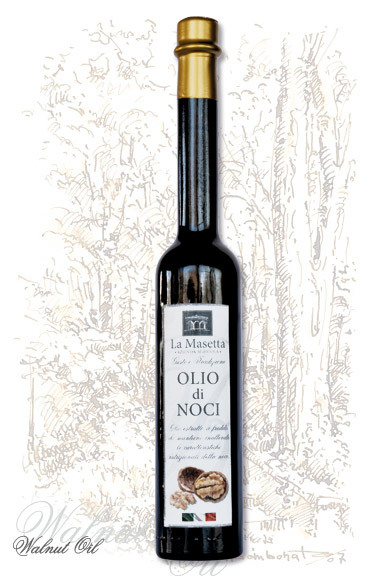 Traditional Modena Balsamic Vinegar P.D.O. Walnut Oil stands out for its high content of polyunsaturated and monounsaturated fatty acids which give the product many interesting healthy properties. Thanks to its vocation for seeking out time-honoured traditions and uncovering the most characteristic qualities of our land, Carlo Bellini’s Farm has been able to prove that the production of Walnut Oil was a consolidated practice centuries ago in the lands belonging to the County of the Pico, which includes the municipality of San Possidonio, home to our company. Our walnut oil is packaged in little amber-coloured glass bottles to keep it out of the light and is the result of a cold pressing process, epitomising the most recent extraction technologies, which makes it possible to maintain the typical sensory properties of the walnut intact. Walnuts and Walnut Oil are distinctive in the vegetable world for their unusual abundance of polyunsaturated and monounsaturated fatty acids, a quality that makes them a genuine mine of alpha-Linolenic acid, also found in seafood, fatty acids from the Omega 6 and Omega 3 series, as well as a notable quantity of minerals, such as phosphorus, potassium, magnesium, calcium, iron etc., and vitamins, which help combat the aging process, including the renowned vitamin E which carries out a strong antioxidant action. Walnut proteins also include arginine, a substance used for the prevention of arteriosclerosis. Walnut Oil is consumed raw, preferably as part of a low calorie dish. A few drops of this precious oil on meat, fresh cheese, pasta, fish and vegetables will delight your taste buds and help combat excessive levels of triglycerides and cholesterol in your blood, bringing them back down to normal levels.